Craps is an action packed game that’s fast and equally loud. Although the rules and bets may seem incredibly complex, craps is easy to play. Players bet on the outcome of two rolled dice. Depending on the bets made, the house edge can be less than 1 percent. The game has become increasingly popular over the years, where you will find a large following even at online casinos. Enter any land-based casino and you are sure to find the craps table the loudest. All it takes is a basic understanding of the game to have a firm grasp of what’s goes on at the table and enjoy a great game as the excitement unfolds. 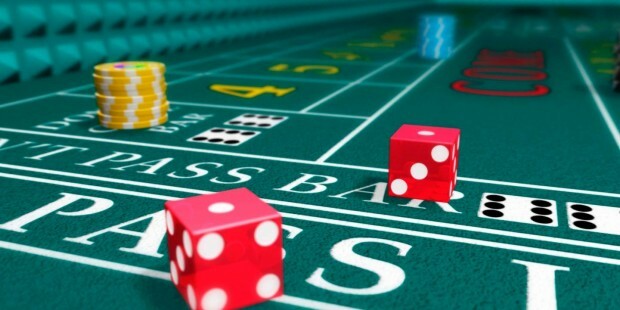 Rules of the online version of craps are a little different from those at land-based casinos. The best thing is you don’t have to learn all the intricacies to play and win big with craps. Just focus on the basics and you can enjoy a profitable game. The two dice are the very heart of any craps game. The objective is to bet on the outcome of the roll. With two dice in the fray, there are 36 possible ways to land a throw, which leaves players with a 1 in 36 chance of rolling any single combination. The game involves a series of tosses of the dice. Craps can accommodate up to 14 players at a time. Each player gets to roll the dice and the honor moves clockwise around the table. The shooter is the person who rolls the dice, which in most cases, will be you when you play online craps. The objective is to roll a 7 or an 11 on your first roll (known as the come out roll. If you roll 2, 3 or 12, you end up with a ‘craps roll’, which in simple terms means you lose. If you roll any other number it establishes a pass line point, where as the shooter you need to roll this number again prior to rolling a 7. If you roll a 7 before the pass line number once more, you lose. There are many side bet options in Craps. However, it is important to choose these options when you are familiar with the basics. There hasn’t been a movie scene in an American casino where the viewer hasn’t been treated to a game of Craps. There is a very good reason for it – the game is absolutely fantastic. Become familiar with the craps table layout. Craps looks immeasurably more complicated than it actually is. The game is simple, in itself, and the rules are as clear as can be. If you want to learn how to play craps correctly, then you should know that in this context less is more. This means that you don’t have to know all the bets, since most of them are really bad. The game of craps is not that complicated and when you know the best odds, you can play them and win more frequently. Time and again I see people throwing their money at the house in the hopes of beating the house at its own game. The game of Craps is quite simple and straightforward, indeed. What may cause it to appear more convoluted to the new player is the enormous variety of bets one can place. In this section, we will familiarize ourselves with most of these bets in the hopes that by the end it will all become clear. Craps is one of the most fascinating games in the whole casino. It enables you to play a game where you get a real shot of making some good money with a very small house edge (if you know how to bet, that is).